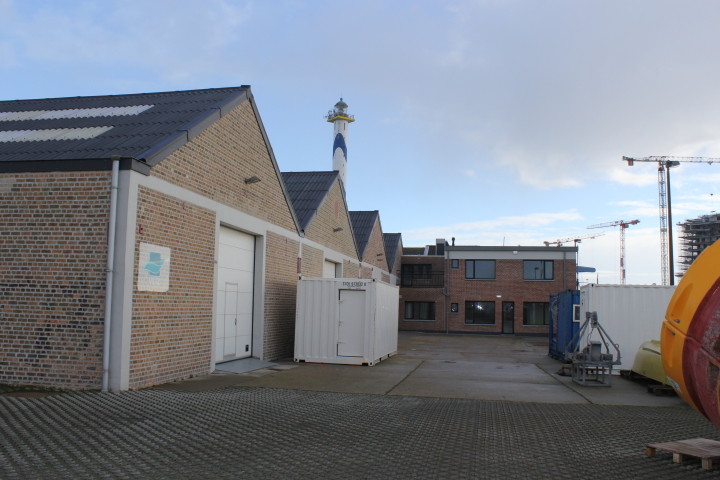 The Marine Station Ostend (MSO) is a coastal satellite laboratory available for all Flemish marine scientists. The MSO comprises multifunctional laboratories, provides storage capacity for scientific equipment and has space for public activities. The Marine Station Ostend (MSO) is located in four former warehouses at the “Halve Maan” site at the eastern bank of the Ostend harbor. The MSO is a satellite laboratory at sea for all Flemish scientists and is used in the framework of European infrastructure networks (Lifewatch, ICOS, EMBRC). The MSO accommodates many facilities, divided over four warehouses, each of which has its own function(s). Warehouse 1 contains a large cold room (100 m²) with seawater tanks, acting as an experimental environment (mesocosm). pH and temperature are controlled in these tanks in order to perform research on fish and other organisms in a semi-natural environment. Warehouse 1 also acts as a storage and processing location for marine archeological heritage. Warehouse 2 comprises all laboratories of the whole MSO. Included are a Lifewatch lab (37 m²), containing (among others) a zooplanktonscanner, a DNA lab (33 m²) and an ICOS laboratory (48 m²), including an anorganic carbon analysis device, an alkalinity measuring device and a nutrient analyzer. In addition, a brand new microscopy lab, containing a scanning electron microscope, is present. Warehouse 2 is also the place where the material of the scientific diving team is dried and stored. Warehouse 3 is mainly a working environment, hence the presence of all the technical infrastructure (workspaces, storage). Besides this, the ROV is maintained in this warehouse and the RIB Zeekat is located here when not at sea. Through warehouse 3, access to the core repository (70 m²) is assured. Warehouse 4 acts as a storage location for the majority of the scientific material and as an area for public activities. It is a multifunctional location, used for all sorts of activities. Besides the warehouses, a residential building and an outdoor place are present. The residential building houses the offices of the infrastructure department. The outdoor place contains (among others) the ROV- and vibrocorer containers. Additionally, there is ample space for baths, necessary for the desalinization of archaeological heritage. In case of questions regarding scientific installations and use, please contact VLIZ. If you - as a scientist - make use of the marine scientific infrastructure and equipment made available by VLIZ, please refer to this in your publications, in particular when using the Marine Station Ostend. How to reach the Marine Station Ostend?